Did you know that the plural of octopus is octopuses or octopodes? Me neither. According to the dictionary, octopi is definitely wrong. I’ve recently come to learn that octopuses are AWESOME! 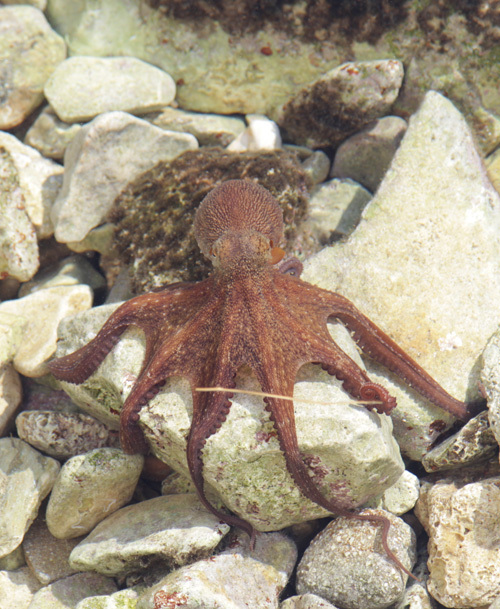 During our holiday in Greece we bumped into an octopus on three separate occasions. The waters around Kefalonia are crystal clear and bursting with interesting marine life; perfect for snorkeling. So, on one bright, warm day we headed out on an excursion with Jamie, a marine biologist, whose main area of study was octopuses, hence my sudden interest in them. Our transportation for the day was a traditional Greek working boat or Kaiki which sailed us around the coast, stopping along the way to drop anchor so we could learn about urchins, starfish, eels, sea cucumbers and octopuses. Jamie, kept us rapt with tales of Greek mythology, mafia and marine life in between our snorkeling adventures when were left to explore the bays and mingle with the fish. Within moments of taking our first dip into the water I stumbled upon an octopus gliding across the seabed – what luck! I squealed with excitement through my snorkel and called for Jamie who swiftly caught it, but not before it squirted us with ink and wowed us with its ability to change a variety of colours in a matter of seconds. Back on board the boat, we stood over the little guy who eyeballed intently before trying to climb out of the temporary aquarium using its suckers. Not wanting to pass up the opportunity, I couldn’t help touching it. It probably goes without saying that feeling an octopus’s tentacles wrap around your hand is weird and slightly alarming – for a moment I thought it might never let go. After a few interesting octopus anecdotes we put him back in the water and watched him swim away. Below: A photo I took from the end of the pier near our apartment in Fiscardo – this chap was happily minding his own business. Below: our transportation for the day. 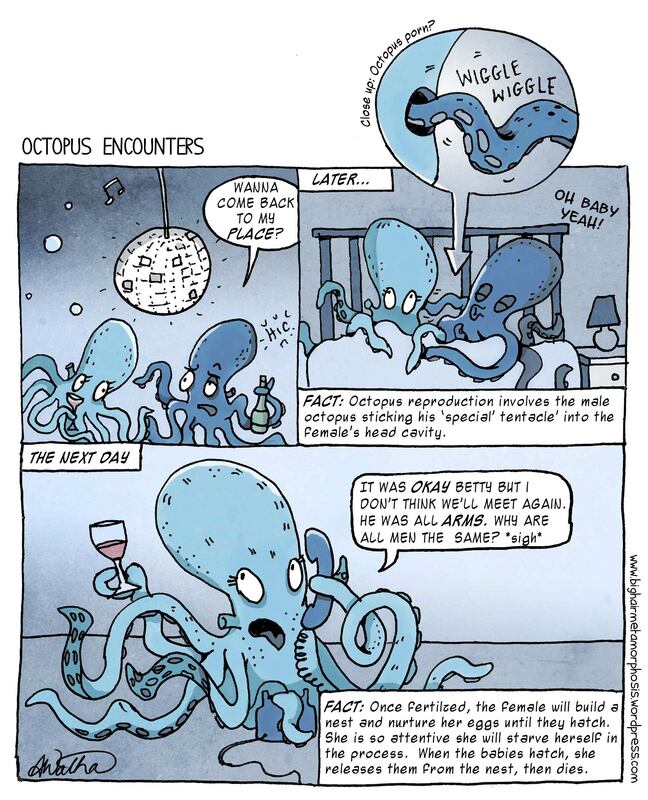 This entry was posted in Animals, Miscellaneous, Photography, travel and tagged cartoon, comic, funny, Greece, holiday, humor, marine, octopus, sailing by bighair63. Bookmark the permalink. Octo-pie? After shaking hands with an octopus, I don’t think I could bring myself to eat one. As for auto correct? maybe it’s American and maybe my Collins dictionary is out of date but it quite clearly states ‘octopi is wrong’. I guess it’s a bit like mongoose…the plural of which is mongooses not mongeese as one might assume. If it’s not a trade secret, may I ask what you do your illustrations in?